PC4PC | What Does PC4PC Mean? 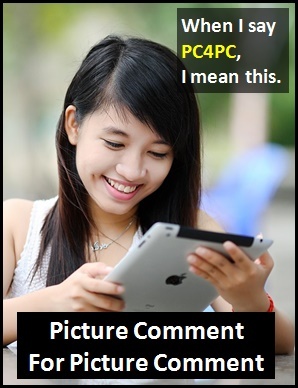 PC4PC means "Picture Comment For Picture Comment". The abbreviation PC4PC was made popular on the social media platform MySpace. PC4PC means that someone will make a comment on an image you've posted, in return for your comment on one they've posted. This sort of "comment trading" is seen as a way to increase the popularity of a user's profile. PC4PC is used in the same way as the abbreviation C4C ("Comment For Comment"). My pictures have comments, therefore I am. Marcia: Did you see my holiday photos on Facebook? Chelsea: Yeah, did you see mine? PC4PC? Charlotte: Why did you leave that comment on my blog? Craig: Remember the one you left on mine last week? PC4PC. That's how it works. The abbreviation PC4PC is a cyber term used to represent the sentence "I will comment on your picture if you comment on mine" (or vice versa).